One of my favorite ways of enjoying tea may not be familiar among the British but it is beginning to sweep the United States by storm. Bubble Tea, or Pearl Tea and Boba Tea (boba is what bubble tea is called in the area I live in), is a Taiwanese variant of milk and tea but with an added twist of little black bubbles. The term bubble comes from the little black “bubbles” or “pearls”* on the bottom of the cup. But what are they? The little bubbles are actually a form of tapioca. The tapioca comes from the cassava root. Americans make tapioca pudding from this but the Taiwanese use this to make their little pearls. They make them small or large. In addition to the tapioca pearls, they add other things like pudding (not the British pudding! ), aloe, and flavored jellies like lychee or mango. This can be added to the milk teas, clear teas, and even the slushies they make! The tea used to make the bubble tea are simple black, green, oolong, and ceylon teas. They are mixed with milk or made iced. Another type of drink that is made by bubble tea shops is called a snow, which is LITERALLY like snow! Just be warned, they’re very hard to drink. The fun part of bubble tea is that the milk tea can be made in many flavors, like coffee, chocolate, taro, red bean, or fruity flavors. The plain teas like black, green, oolong, and ceylon can also be flavored as such. Of course, the MOST fun part is drinking the pearls through a straw. Usually a large, wide straw is given so the pearls can travel up and be chewed (yes, I eat the pearls). Unfortunately, there is a debate among my fiance and I. Where I come from in California, there is a competition for bubble tea. 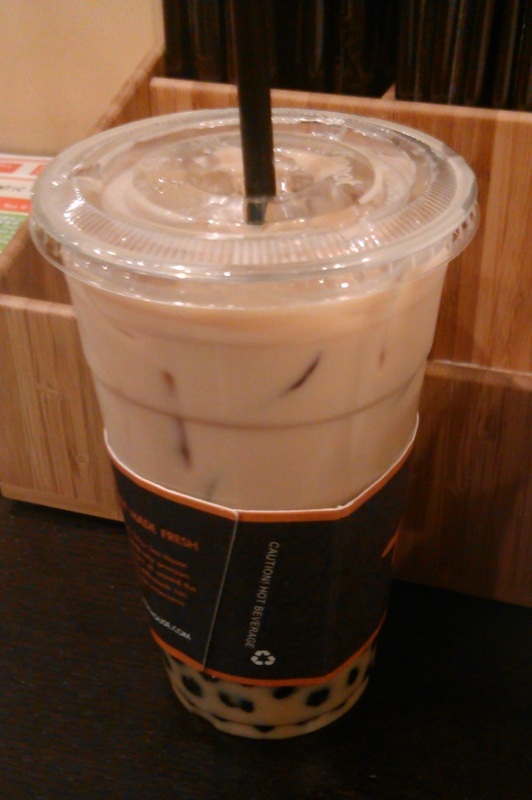 I like to get the “Tapioca Milk Tea” which is made with black tea and milk and I consider it to be the basic flavor but when I visit my fiance out in Virginia, there isn’t such a flavor. I tried to order it out there and everyone gave me funny looks, including the fiance. The closest thing I had to get was coffee/mocha and it just wasn’t the same. I have been a fan of bubble tea since about 2001 or 2002 as a teenager and it’s an undying love for me. The local specialty stores are finally stocking the pearls to make my own bubble tea. You need to take the pearls and cook them. Once I obtain these next time I go, I hope to tell you all how to make them! I have also been told it is just black tea that is used to make the original milk tea. However it is made, bubble tea is delicious! *When consuming these pearls, they CAN be a choking hazard. Do be careful and supervise a young child if they are enjoying one!